Elon Musk has never been short of ideas to promote the company with creative brand merchandise. 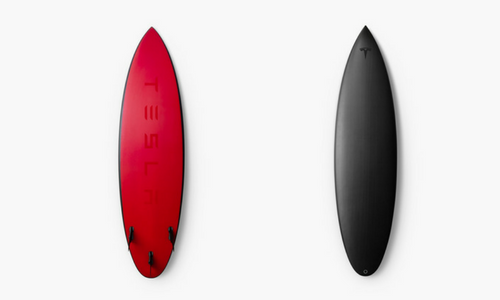 After the company selling caps and Boring flame thrower, the Tesla online Shop has offered last weekend the limited edition surfboard which was sold out overnight. The surfboard is designed by the Tesla Design Studio in collaboration with Lost Surfboards and Matt “Mayhem” Biolos, surfboard shaper for World Surf League Championship athletes. It is made from of a mix of epoxy resin and carbon fiber composite material inspired by Tesla’s “Black Dart”, featuring the matte and gloss finishes taken from Tesla’s vehicle. With the price tag at US$1500, each surfboard was custom made to order, and only 200 were produced. The limited edition strategy apparently worked so well that the board was sold out almost immediately. Tesla has launched men’s and women’s apparel before which were also well-received. It features "Ali", an adventurous individual showing how Allianz offers protection for every uncertainty in life. ..
With the help of creative agency TSLA, it has created Tiger Jams, which is a portal for local talent to connect with established a..